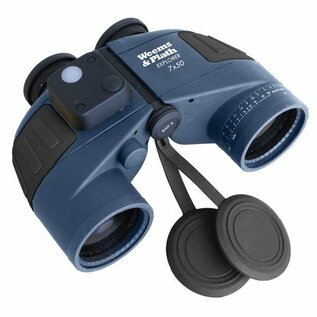 An excellent value and popular choice, the Weems Explorer 7 x 50 binoculars float, are waterproof, and have the added feature of an illuminated compass and range finder reticle. The built-in magnetic compass appears superimposed near the image seen through the lens, allowing the user to take compass bearings of an object. The built-in range-finding reticle allows the user to calculate the distance from an object of a known height. The ability to take accurate compass readings on the water makes these lightweight binoculars perfectly suited for safe navigation while racing or coastal cruising.